This page appeared as an article by Mark Whittaker in the June 2002 issue of the Community News, in our regular feature "Local History & Heritage with the Marple Website". A shorter version was included in the 2002 Carnival programme. It was intended for this article to include photographs from the 1962 copy of the Reporter but unfortunately the film has been lost by the developing labs used by Savers on Market Street. If the pictures are ever returned they'll be added here. Ladies and Gentlemen, "THE CARNIVAL"…… in the next few weeks a great deal will be seen and heard about the Carnival, which has now become an institution in Marple. The long-standing residents will be "genned" up of its aims, but those who have recently come into the district may wonder, what is it all about. – This is how Monty Burton began his programme notes in the 1969 Carnival programme. Well, if it was an institution then, only seven years after its revival, what is it today! The month of June would be unthinkable without the Carnival in Marple and now the fantastic milestone of forty uninterrupted years of celebrations has been reached, there are many people living in the area who have never known life in Marple without it. There is evidence that Carnivals were held in Marple around the turn of the last century and in local archives and in the Marple Website's picture galleries are photographs of Marple Carnival in 1905 and 1906. In 1911 a Festival was held to commemorate the Coronation of King George V but there are no records of any similar events and it's assumed they lapsed as a result of the two World Wars. 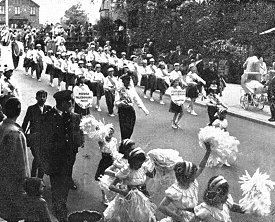 There was a pageant for the dedication of Marple War Memorial held in 1922 and in 1951 Marple took part in the Festival of Britain, but no thoughts of a regular celebration were heard until 1961. 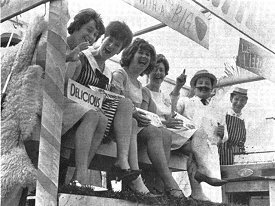 In that year Bryan Lockyear, a resident of Marple, came up with the idea of reviving the Marple Carnival. Following his initiative, a local public committee was set up "to organise a local Carnival in Marple, the proceeds of which should be donated to Local Charities". Bryan became the first Organising Secretary and a young Monty Burton became Chairman of the Marple Carnival Charities Committee. The first revived Carnival was held in 1962 and was a resounding success. Since then a Carnival has been held annually and it's become an essential fixture on the Marple calendar. Monty Burton continued in his role as Chairman of the Committee for a further 27 years, becoming something of an institution himself. 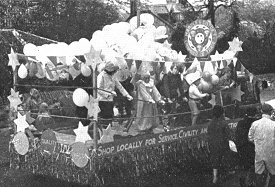 The longevity of Marple's Carnival is due to the superb foundations he and his wife Marjorie created and upon which others have since been able to build. Marple's first Carnival on Saturday, made memorable history, with scenes never previously equalled. To honour Miss Diana Brownsey, Marple's first carnival queen and to precipitate Marple into a gay holiday mood, the proceedings opened with a mile long procession, that snaked through flag-decked streets to the throb and harmony of four bands: the 27th Manchester Boys Brigade and 42nd Manchester Boys Brigade and a pipe band, as well as colourfully costumed jazz bands. The flanking pavements were choked with people who later flocked to Brabyns Park. 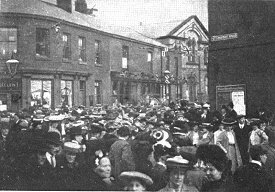 At one stage the centre of Marple was completely ringed by the procession when a tail and lead overlapped at the junction of Market Street and Stockport Road. Marple's carnival mood was widely infectious, for visitors poured into the village by buses and cars; and when all available car parks were full, the parked cars lined all the approaches. The crowd that converged on Brabyns Park for the crowning of the queen and subsequent entertainment was variously estimated as being between ten and fifteen thousand. It certainly staggered the most optimistic of the organisers; and it is hoped that profit from the day – all for the Marple old folk's clubhouse building fund – will be equally staggering. Local organisations and firms cooperated in providing lorried tableaux and trade exhibits for the procession and notes of novelty and humour were well sounded. Marple old aged pensioners rode along in gay nineties costume, but made their choir conductor, Mrs Madge Brennand, walk in a most effective guise as Marie Lloyd. Kay Bros. (Plastics) introduced their foam products through a sleeky harem scene. Marple Young Liberals looked on mischief bent as the female horrors of St. Trinians; Mrs Miller brought out the children of Bowden Lane as Black and White Minstrels; Marple 18 Plus Group made an eloquent plea for the green belt; and Mrs. Redfern introduced the children of Norbury Drive as 'the hayseeds'. Other praiseworthy lorries were added by organisations; and the Women's Junior Air Corps trainer plane was a great attraction. A vintage motorcar and early motorised fire engine were other points of interest on wheels. On foot there were at least a hundred comic or fancy dressed characters; and nine troops of Morris dancers, nine entertaining troops and four jazz bands added another four or five hundred costumed marchers to the grand parade, that left the Recreation Ground and reached Brabyns Park about half an hour later. At Brabyns Park were fun-fair amusements, sideshows, refreshment tents, and arenas for a children's pet show and four hours entertainment and competition by the troupes of dancers, entertainers and jazz bands, many already hung with championship medals. Television personality, Mr. Bill Grundy, a local resident and patron of the Carnival, set the park activities in motion by crowning Carnival Queen Miss Brownsey. The new chairman of the Council, Councillor A. L. Russell, president of the carnival, and Mrs. Russell were also on the crowning dais with the Carnival Queen of Great Britain, Miss Barbara Roberts, Stockport's Carnival Queen, Miss Barbara Dean, Hayfield's May Queen, Miss Margaret Booth, Miss Cheshire Rose, the Manchester and District Carnival Organisation's queen (Miss Sheila Barber) and Marple's bathing beauties picked at last week's water show. Queen Diana, wearing a princess style frock of white brocade, which she had made herself, and a royal blue velvet train and carrying a spray of roses, looked radiant and was roundly applauded as Mr. Grundy, placing the crown, claimed the privilege of congratulating her with a kiss. He said she was 'an absolutely stunning girl' and 'absolutely home grown'. She was accompanied by her two princesses, in primrose cotton dresses, again in princess style with green sashes, Miss Irene Kirk and Miss Jean Baguley. Queen Diana called upon the crowd to dig deep into their pockets for the benefit of the old folks of Marple. She promised to do her best to be a fitting queen and a worthy representative of Marple. Then, as today, carnivals were not just about having fun and the serious side concerns raising as much money as possible for local charities. In the 1972 programme it was reported that the Carnival had donated a total of £5,100 to charitable organisations in the district, with the previous year's donation of £710 becoming a new record. Ten years later the annual donation had risen to another record level of £2,500 and the total was approaching £20,000. In 1992 £3,700 was donated and in 2002, who knows – but it's hoped to beat last year's figure, when the grand total of money raised for local charities had approached an impressive £75,000. Over the last 40 years many people have contributed a great deal of time and effort to make Marple Carnival the success story it has become. Despite this a constant theme featured in past programmes has always been the appeal for additional help and volunteers. Today's Carnival Committee is no different and would welcome new ideas, enthusiasm and commitment. So, if you'd like to play a role in ensuring another 40 years of success for Marple Carnival, please get in touch with current Chairman Bill Ardern today. Of course, if you have anything to share about Marple's history and heritage, please get in touch with Mark or Peter using our contact us page.